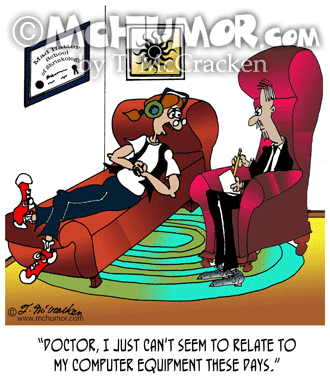 Computer Cartoon 9084: A man on a psychiatric couch saying, "Doctor, I just can't seem to relate to my computer equipment these days." 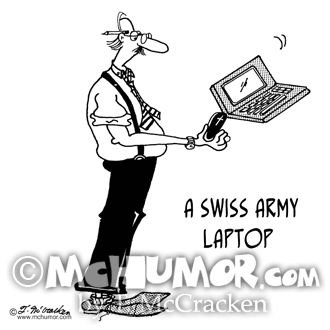 Computer Cartoon 4917: Someone flicking open "A Swiss Army Laptop." 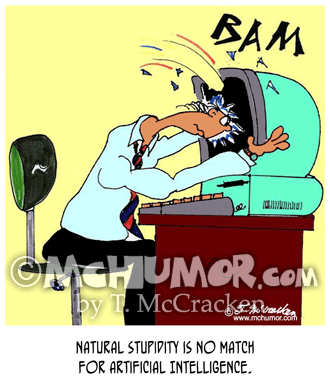 Computer Cartoon 6765: "Natural Stupidity is no match for Artificial Intelligence." 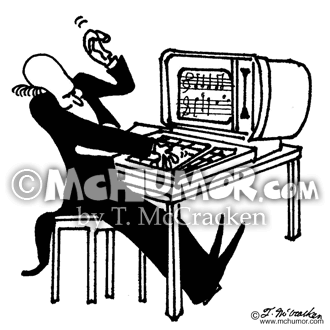 A computer operator puts his head through a monitor. 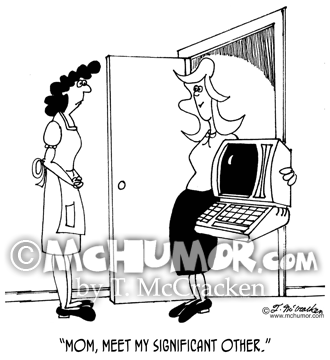 Relationship Cartoon 4453: A woman hugging a computer standing at a house entryway saying, "HI, Mom. 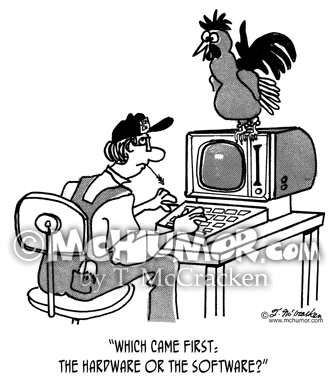 Meet my significant other." 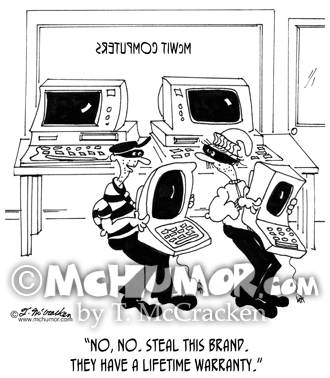 Computer Cartoon 7063: A thief stealing a computer saying to another, "No, no. 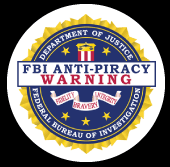 Steal this brand. 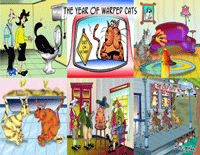 They have a lifetime warranty." 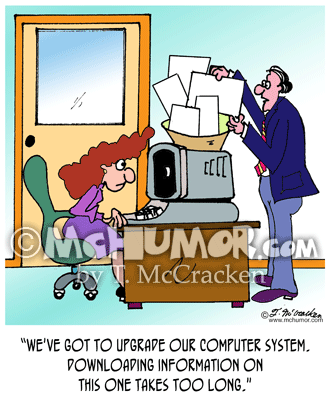 Computer Cartoon 7508: A man at a Data Processing Office dumping papers into a chute on top of a computer says, "We've got to upgrade our computer system. 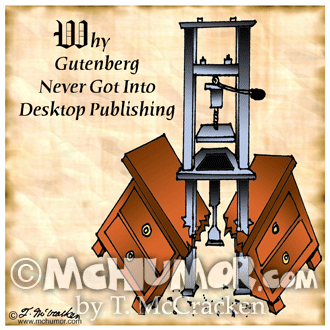 Downloading information on this one takes too long." 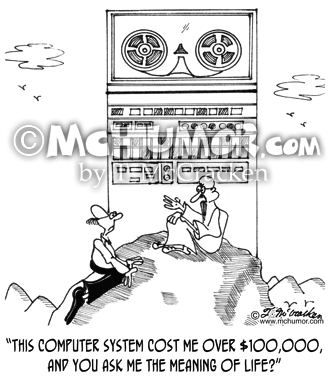 Computer Cartoon 2845: A guru with a huge main frame computer says to a man who's climbed his mountain, "This computer system cost me over $200,000, and you ask ME the meaning of life?"